‪TIGOSE (The International Guild of Specialist Engineers) starts the year with a new Commercial Partner and a new Member, who join top specialists and businesses in the classic car and historic racing car industry, as part of the Guild. Helix Autosport is based in Banbury, Oxfordshire, a hotbed of technological excellence in the automotive industry; a leading supplier of hand-made clutches and flywheels, famous for their reliability and performance (both on and off the race circuit) Helix Autosport prides itself on designing, machining, assembling and testing its entire product range in-house. Helix joins TIGOSE as the latest Commercial Partner. 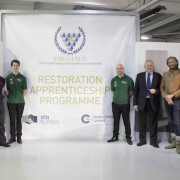 “I feel that there is a unique match of interests and expertise between Helix Autosport and TIGOSE Members and their businesses,” says Helix Autosport Managing Director Terry Ormerod. TIGOSE Commercial Partners are businesses whose activities, products or services, directly or indirectly, support the classic car and historic racing car industry and, by extension, TIGOSE Members. Jersey-based Art Metal, a brand new company which has just settled into its new large premises on the island, is owned by coachbuilder and artist Neil McKenzie, whose own expertise spans over two decades. Art Metal specialises in the restoration of original hand-formed aluminium automotive bodywork, bespoke creations, replica projects and custom part fabrication. McKenzie also creates metal sculpture artwork by commission. “We work closely on many Aston Martin-related projects, from overall metal restoration to manufacturing parts; in fact, most recently we manufactured an Aston Martin DB4GT Zagato’s fuel tank for Aston Service Dorset, from original factory drawings to exact specifications. TIGOSE is a very special and exclusive club of which any serious specialist ought to be part,” adds Neil McKenzie. 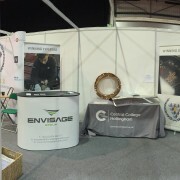 TIGOSE recently attended the Autosport Engineering Show, part of Autosport International. As its Members and Partners all contribute in the fields of historic motorsport and performance engineering, TIGOSE will next be seen at the London Classic Car Show, taking place on the last weekend of February. Log in www.tigose.com for information about membership benefits, a full list of Members, Commercial Partners and Preferred Partners. TIGOSE also has a Facebook Page and a LinkedIn Group.